There are 18 species in the weevil genus Gerstaeckeria in North America, north of Mexico. Of these, only Gerstaeckeria hubbardi (LeConte) and Gerstaeckeria fasciata Pierce, feed on cacti of the genus Opuntia in Florida. Figure 1. Adult Gerstaeckeria hubbardi (LaConte), a cactus weevil. Head at right. Photograph by Lyle J. Buss, University of Florida. Gerstaeckeria hubbardi is known in Alabama, Georgia and Florida (Peck and Thomas 1998). It probably occurs throughout peninsular Florida. Gerstaeckeria fasciata was originally described from Buck Key, Florida. All known localities are in Monroe County, and the species may be confined to the Florida Keys, associated with one or more of the southern species of Opuntia. These are medium sized weevils with Gerstaeckeria hubbardi 7.5 to 9.5 mm, and Gerstaeckeria fasciata 5.0 to 5.8 mm in length (O'Brien 1970). Beaks are concealed in a groove. Surfaces are coated with minute scales which vary in color from white through shades of brown to black. These scales can be rubbed off and the pattern is somewhat variable. The general pattern of white humeral angles and a broad light colored apical band is similar in many species, including the two Florida ones. All members of this genus are known to breed in Opuntia cacti, although there has been little specific data published on their life histories. Brief notes on western species were published by Pierce (1907, 1912), and Hunter et al. (1912). The adults feed externally on the pads, often hiding beneath those on the ground during the day. Both Florida species appear to be more active at night. When disturbed they drop to the ground, fold up the legs, and feign death. They are difficult to distinguish from their surroundings. Figure 2. Adult Gerstaeckeria hubbardi (LaConte), a cactus weevil. Head at top. Photograph by Lyle J. Buss, University of Florida. Figure 3. Adult Gerstaeckeria hubbardi (LaConte), a cactus weevil, feigning death. Head to right. Photograph by Lyle J. Buss, University of Florida. The larva of Gerstaeckeria hubbardi feeds within the pads, producing semicircular scars, leaving the epidermis intact. The single pad is usually killed and sometimes separates from the main plant. Hunter et al. 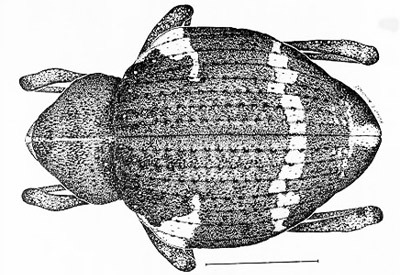 (1912) suggested that the weevil appears "...to follow the work of Melitara prodenialis Walker." This is a moth of the family Pyralidae, the larvae of which feed on Opuntia in Florida. Figure 4. 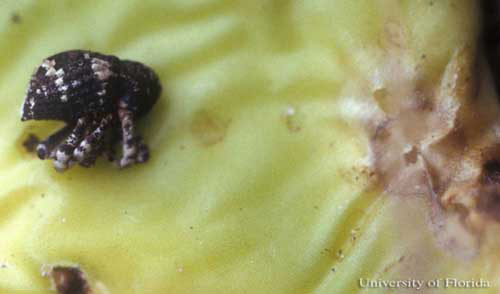 Larva of Gerstaeckeria hubbardi (LaConte), a cactus weevil. Photograph by Division of Plant Industry. Figure 5. Adult Gerstaeckeria hubbardi (LaConte), a cactus weevil, near larval damage (right). Photograph by Lyle J. Buss, University of Florida. 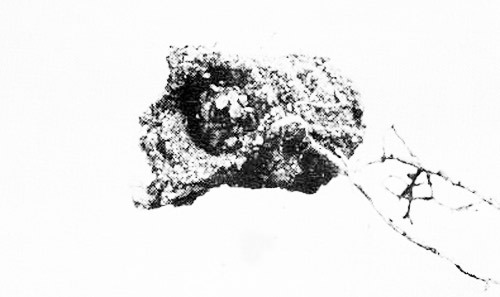 The pupal cell of Gerstaeckeria hubbardi is formed near the base of the pad and is composed of sand grains cemented around a chamber of larval feces and decaying cactus. The adult may remain in the cell for some time before emerging. Adults have been collected in Florida every month except January, July, August, September, and October. Most of the records are for April, May, and June. Figure 6. Pupal cell of Gerstaeckeria hubbardi (LaConte), a cactus weevil. Photograph by Division of Plant Industry. Figure 7. 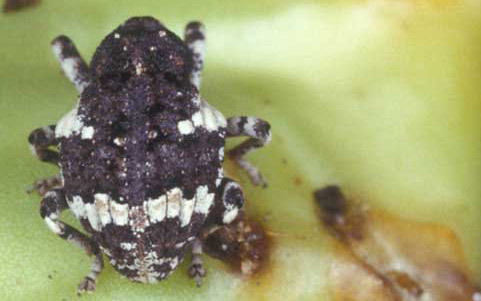 Adult Gerstaeckeria hubbardi, showing cryptic coloration. Drawing by Division of Plant Industry. All known species are associated with cacti of the genus Opuntia (sens. lat.). Gerstaeckeria hubbardi was listed by Pierce (1912) from Opuntia vulgaris. However, Small (1925) did not list this species from Florida although he does list approximately 13 other species of Opuntia from within the range of Gerstaeckeria hubbardi. At Gainesville, the author found it on the "joe jumper," probably Opuntia tracyii. The localities where Gerstaeckeria fasciata was found are within the distribution of at least three species of Opuntia (dillenii, keyensis, stricta). The genus Opuntia is a large and taxonomically confusing one, with the status of several Florida forms somewhat in doubt. However, it is likely that Gerstaeckeria hubbardi feeds on several species. It is possible that Gerstaeckeria fasciata, with its restricted distribution, is more host specific. 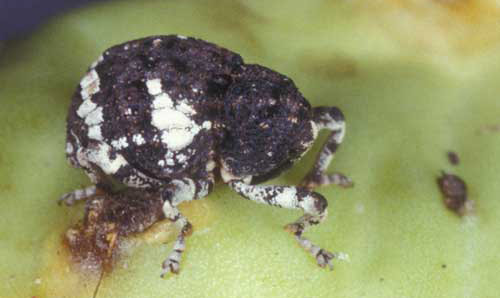 Since most members of the genus Opuntia are considered weeds or undesirable plants, these weevils are therefore beneficial. 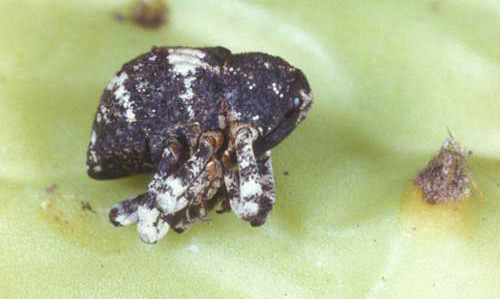 However, their damage has not been noted severe enough to suggest their usefulness in biological control. Additional life history studies may suggest their value in combination with other cactus-feeding insects. Blatchley WS, Leng CW. 1916. Rhynchophora or weevils of North Eastern America. Nature Publishing Co., Indianapolis. 682 pp. Carpenter JE, Bloem KA, Bloem S. (2001). 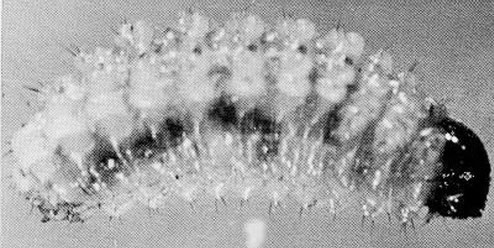 Applications of F1 sterility for research and management of Cactoblastis cactorum (Lepidoptera: Pyralidae). Florida Entomologist 84: 531-536. Fisher WS. 1925. New cactus weevil from Texas. Journal of the Washington Academy of Sciences 15: 425-426. Hunter WD, Pratt FC, Mitchell JD. 1912. The principal cactus insects of the United States. USDA Bureau of Entomology Bulletin 113: 1-71. Kissinger DG. 1964. Curculionidae of America north of Mexico; a key to the genera. Taxonomic Publishing, So. Lancaster, MA. 143 pp. O'Brien CW. 1970. Taxonomic revision of the genus Gerstaeckeria north of Mexico (Coleoptera: Curculionidae). Annals of the Entomological Society of America 63: 255-272. Pierce WD. 1907. On the biologies of the Rhynchophora of North America. Nebraska State Board of Agriculture Zoological Report (1907): 247-319. Pierce WD. 1912. Systematic notes and description of some weevils of economic or biological importance. Proceedings of the U.S. National Museum 42: 155-170. Small JK. 1925. Gathering cacti in the eastern coastal plain. Journal of the New York Botanical Gardens 26: 241-258 and 265-285. Peck SB, Thomas MC. 1998. Family Curculionidae. A Distributional Checklist of the Beetles (Coleoptera) of Florida. Florida Department of Agriculture and Consumer Services. (9 October 2018). Author: Robert E. Woodruff (retired), Florida Department of Agriculture and Consumer Services, Division of Plant Industry. Originally published as DPI Entomology Circular 82. Updated for this publication. Publication Date: July 2006. Latest revision: December 2009. Latest review: October 2018.